Background: In repaired tetralogy of Fallot (TOF), exercise test parameters like peak oxygen uptake and ventilatory efficiency predict mortality. Studies have also suggested cardiac magnetic resonance (CMR)-derived right ventricular (RV) size threshold values for pulmonary valve replacement in repaired TOF. However, effects of proposed RV size on exercise capacity and morbidity are not known. Methods: The relationship between CMR-derived ventricular size, function, and pulmonary regurgitation (PR) and NYHA class, exercise performance, and electrocardiogram (ECG) was studied in patients of repaired TOF with pure PR in a retrospective review of records. Results: 46 patients (22 females), mean age 14 years (8−30.8), were studied. There was no relationship between CMR-derived ventricular size, function, or PR and exercise test parameters, or NYHA class. RV end systolic and end diastolic volume correlated positively with the degree of PR. QRS duration on ECG correlated positively with RV end-diastolic volume (P < 0.01, r2 = 0.34) and PR (P < 0.01, r2 = 0.52). Conclusions: In repaired TOF and pure PR, there is no correlation between ventricular size or function and exercise performance. RV size increases with increasing PR. Timing of pulmonary valve replacement in TOF with pure PR needs further prospective evaluation for its effect on morbidity and mortality. In patients with repaired TOF, cardiovascular magnetic resonance (CMR) has emerged as the "gold standard" in evaluation of the RV and quantification of PR. Traditionally, pulmonary valve replacement in repaired TOF with severe regurgitation is performed when there are overt symptoms of progressive exercise intolerance or heart failure, syncope, or ventricular tachycardia. ,,, Recent studies have advocated early replacement of the pulmonary valve in this group of patients based on failure of postoperative normalization of RV size if the surgery is delayed. ,,,, However, these reports have failed to show any beneficial effect of early replacement of the pulmonary valve on patient's morbidity or mortality. In patients with repaired TOF, exercise test parameters like peak oxygen uptake and ventilatory efficiency (VE/VCO 2 slope) have been shown to predict cardiac death on follow-up. In this study, we evaluate the effects of CMR-derived ventricular size and function and PR on patient's symptoms (NYHA class), functional capacity (exercise performance), and electrocardiogram (ECG) findings in repaired TOF with pure PR and no significant stenosis. Congenital CMR database at our institution was reviewed to identify all patients with repaired TOF and significant pulmonary valve regurgitation between 1/2006 and 1/2010. Patients with a pure regurgitant lesion (patients with moderate or more PR and less than 20 mmHg peak instantaneous RV outflow tract gradients on echocardiogram) who underwent exercise stress test and CMR within 4 weeks of each other were included in the study. Patients with mixed stenotic and regurgitant lesions were excluded from the study. The study was approved by University Institutional Review Board. CMR imaging was performed on 1.5 T scanners (GE Medical System, Milwaukee, WI, or Siemens, Erlangen, Germany). Retrospective gated steady-state free-precession (SSFP) cine images were used for the assessment of the RV and left ventricular (LV) volumes as well as systolic function. The cine SSFP sequence parameters were as follows: repetition time 2.8 ms, echo time 1.4 ms, flip angle 51°, slice thickness 8−10 mm, matrix 192 × 256, field of view 300−380 mm, and temporal resolution 25-40 phases. RV and LV volume and systolic function were calculated using Simpson's rule by manually tracing the endocardial outline at end-diastole and end-systole in each of the short-axis cine images (QMass MR, Medis, Leiden, The Netherlands). Free breathing cine phase contrast flow measurements were acquired in the main pulmonary artery (40 phases per cardiac cycle) with retrospective cardiac gating (repetition time 5.9 ms, echo time 3.7 ms, flip angle 150°, slice thickness 6 mm, matrix 256 × 256). The velocity-encoded peak velocity was typically 200. Pulmonary flow was calculated from the phase-contrast images with a semiautomatic vessel edge-detection algorithm with operator correction (QFlow MR, Medis, Leiden, The Netherlands). PR fraction was calculated as the percent backward flow over the forward flow. All volume and flow measurements were indexed for body surface area and expressed in ml/m 2 . Cardiopulmonary exercise testing was performed using a bicycle ergometer. The workload was increased by 10−20 W/min and patients exercised until exhaustion. Breath-by-breath respiratory gas exchange measurements and the 12-lead ECG were monitored continuously during the exercise test. Blood pressure was recorded every 2 min. The following data were obtained from the exercise stress test: (1) peak oxygen uptake, (2) anerobic threshold (using modified V-slope method), (3) oxygen pulse (peak oxygen uptake/peak heart rate), (4) respiratory exchange ratio (RER), (5) ventilatory efficiency (slope between minute ventilation and carbon dioxide elimination using linear regression analysis), (6) peak work, and (7) peak heart rate. The tests were considered maximal with a RER of ≥1.09. Patient's medical records were reviewed to obtain data regarding patient symptoms, and QRS duration on ECG. Based on symptoms, patients were classified according to the New York Heart Association functional class. Continuous variables are summarized as mean ± SD or median and range. The proportions are expressed as percentages. Pearson's correlation coefficients were used to assess relations between the following parameters: (1) biventricular size and systolic function and various parameters of exercise performance, (2) degree of pulmonary valve regurgitation and various parameters of exercise performance, (3) RV size and QRS duration on ECG, (4) biventricular size and systolic function and NYHA grade, and (5) degree of pulmonary valve regurgitation and NYHA grade. Multiple linear regression analysis was used to evaluate the simultaneous effects of MRI measures on exercise performance parameters. Multivariate linear regression analysis was performed using the independent variables with P values < 0.05 on univariate analysis. All statistical tests were two sided, and P < 0.05 was considered statistically significant. A total of 46 patients were included in this retrospective study. The majority were in NYHA class I or II. The baseline patient characteristics are shown in [Table 1]. CMR findings and exercise stress test findings are shown in [Table 2] and [Table 3], respectively. On linear regression analysis, there was no statistically significant relationship between any parameter of exercise performance and CMR-derived parameters of ventricular size, function, or degree of PR. 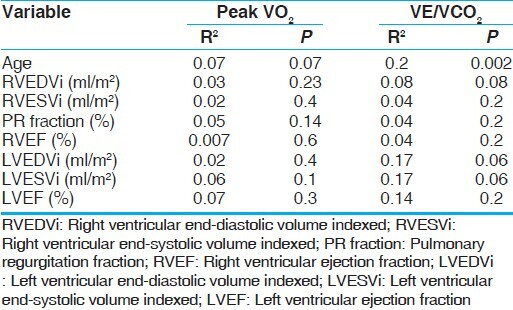 [Table 4] depicts the lack of statistical correlation between CMR-derived parameters of RV and LV size, systolic function and degree of PR, and peak oxygen uptake and ventilator efficiency slope (VE/VCO 2 ). As expected, VE/VCO 2 increased with advancing age. 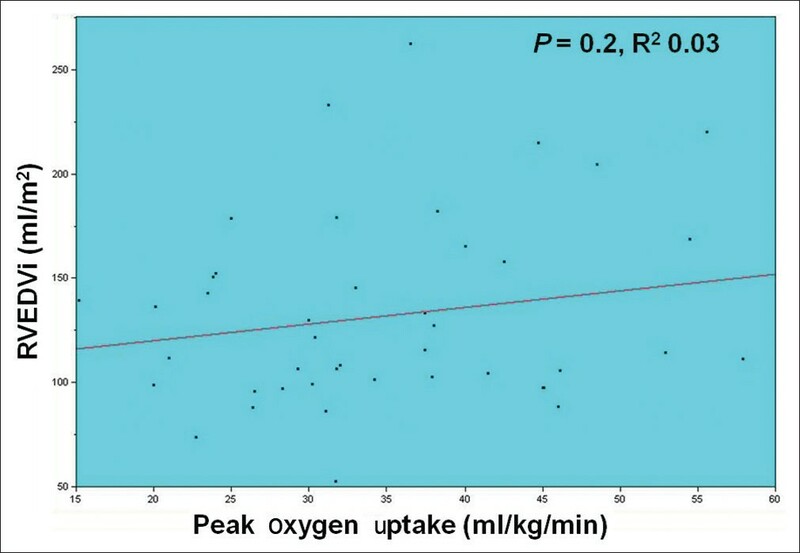 [Figure 1] shows the lack of correlation between peak oxygen uptake and RV end-diastolic volume. The findings remained unchanged on subgroup analysis including patients with RV end-diastolic volume of >150 ml/m 2 (n = 13). There was a statistically significant and positive correlation between degree of PR and RV end-systolic (P = 0.0003, r2 = 0.3) and RV end-diastolic volume (P < 0.0001, r2 = 0.4) indicating an increase in ventricular volume with worsening PR [Figure 2]. There was no relationship between RV and LV size, RV and LV function, or degree of PR and NYHA class. QRS duration on ECG correlated positively with RV end-diastolic volume (P < 0.01, r = 0.34) and degree of PR (P < 0.01, r = 0.52). In this study, QRS duration on ECG correlated positively with RV end-diastolic volume and PR fraction. Previous studies have shown association between QRS prolongation in this cohort and adverse outcome including ventricular tachycardia and sudden death. , In repaired TOF, severe PR can lead to RV dilation and QRS prolongation which may be a harbinger for future ventricular arrhythmias and sudden death. However, effects of the proposed CMR-derived RV size threshold on future risk of ventricular tachycardia and sudden cardiac death are unknown. This study is limited by its retrospective nature and findings of this study are only applicable to patients with repaired TOF and pure PR. This study was not designed to answer the long-term outcome of patients with a dilated RV and PR. The etiology of exercise intolerance in patients with repaired TOF and PR is multifactorial. We speculate that apart from the ventricular size, factors like genetic predilection, abnormal RV hemodynamics, ventricular scarring, autonomic dysfunction, and restrictive pulmonary function may play an important role in determining the exercise capacity in this cohort. The long-term effect of restoration of size on patient morbidity and mortality requires attention in future studies. 1. Kirklin JW, Wallace RB, McGoon DC, DuShane JW. Early and late results after intracardiac repair of Tetralogy of Fallot. 5-Year review of 337 patients. Ann Surg 1965;162:578-89. 2. Bacha EA, Scheule AM, Zurakowski D, Erickson LC, Hung J, Lang P, et al. Long-term results after early primary repair of tetralogy of Fallot. J Thorac Cardiovasc Surg 2001;122:154-61. 3. Parry AJ, McElhinney DB, Kung GC, Reddy VM, Brook MM, Hanley FL. Elective primary repair of acyanotic tetralogy of Fallot in early infancy: Overall outcome and impact on the pulmonary valve. J Am Coll Cardiol 2000;36:2279-83. 4. Pigula FA, Khalil PN, Mayer JE, del Nido PJ, Jonas RA. Repair of tetralogy of Fallot in neonates and young infants. Circulation 1999;100 (19 Suppl):II157-61. 5. Murphy JG, Gersh BJ, Mair DD, Fuster V, McGoon MD, Ilstrup DM, et al. Long-term outcome in patients undergoing surgical repair of tetralogy of Fallot. N Engl J Med 1993;329:593-9. 6. Nollert G, Fischlein T, Bouterwek S, Böhmer C, Klinner W, Reichart B. Long-term survival in patients with repair of tetralogy of Fallot: 36-year follow-up of 490 survivors of the first year after surgical repair. J Am Coll Cardiol 1997;30:1374-83. 7. Geva T. Repaired tetralogy of Fallot: The roles of cardiovascular magnetic resonance in evaluating pathophysiology and for pulmonary valve replacement decision support. J Cardiovasc Magn Reson 2011;13:9. 8. Ammash NM, Dearani JA, Burkhart HM, Connolly HM. Pulmonary regurgitation after tetralogy of Fallot repair: Clinical features, sequelae, and timing of pulmonary valve replacement. Congenit Heart Dis 2007;2:386-403. 9. Therrien J, Siu SC, McLaughlin PR, Liu PP, Williams WG, Webb GD. Pulmonary valve replacement in adults late after repair of tetralogy of fallot: Are we operating too late? J Am Coll Cardiol 2000;36:1670-5. 10. Harrild DM, Berul CI, Cecchin F, Geva T, Gauvreau K, Pigula F, et al. Pulmonary valve replacement in tetralogy of Fallot: Impact on survival and ventricular tachycardia. Circulation 2009;119:445-51. Epub 2009 Jan 12. 11. Graham TP Jr, Bernard Y, Arbogast P, Thapa S, Cetta F, Child J, et al. Outcome of pulmonary valve replacements in adults after tetralogy repair: A multi-institutional study. Congenit Heart Dis 2008;3:162-7. 12. Therrien J, Provost Y, Merchant N, Williams W, Colman J, Webb G. Optimal timing for pulmonary valve replacement in adults after tetralogy of Fallot repair. Am J Cardiol 2005;95:779-82. 13. Buechel ER, Dave HH, Kellenberger CJ, Dodge-Khatami A, Pretre R, Berger F, et al. Remodelling of the right ventricle after early pulmonary valve replacement in children with repaired tetralogy of Fallot: Assessment by cardiovascular magnetic resonance. Eur Heart J 2005;26:2721-7. Epub 2005 Oct 7. 14. Oosterhof T, van Straten A, Vliegen HW, Meijboom FJ, van Dijk AP, Spijkerboer AM, et al. Preoperative thresholds for pulmonary valve replacement in patients with corrected tetralogy of Fallot using cardiovascular magnetic resonance. Circulation 2007;116:545-51. Epub 2007 Jul 9. 15. Frigiola A, Tsang V, Bull C, Coats L, Khambadkone S, Derrick G, et al. Biventricular response after pulmonary valve replacement for right ventricular outflow tract dysfunction: Is age a predictor of outcome? Circulation 2008;118 (14 Suppl):S182-90. 16. Geva T, Gauvreau K, Powell AJ, Cecchin F, Rhodes J, Geva J, et al. Randomized trial of pulmonary valve replacement with and without right ventricular remodeling surgery. Circulation 2010;122 (11 Suppl):S201-8. 17. Giardini A, Specchia S, Tacy TA, Coutsoumbas G, Gargiulo G, Donti A, et al. Usefulness of cardiopulmonary exercise to predict long-term prognosis in adults with repaired tetralogy of Fallot. Am J Cardiol 2007;99:1462-7. 18. Meadows J, Powell AJ, Geva T, Dorfman A, Gauvreau K, Rhodes J. Cardiac magnetic resonance imaging correlates of exercise capacity in patients with surgically repaired tetralogy of Fallot. Am J Cardiol 2007;100:1446-50. Epub 2007 Aug 21. 19. Lurz P, Giardini A, Taylor AM, Nordmeyer J, Muthurangu V, Odendaal D, et al. Effect of altering pathologic right ventricular loading conditions by percutaneous pulmonary valve implantation on exercise capacity. Am J Cardiol 2010;105:721-6. 20. Ghez O, Tsang VT, Frigiola A, Coats L, Taylor A, van Doorn C, et al. Right ventricular outflow tract reconstruction for pulmonary regurgitation after repair of tetralogy of Fallot. preliminary results. Eur J Cardiothorac Surg 2007;31:654-8. Epub 2007 Jan 30. 21. Mancini D, LeJemtel T, Aaronson K. Peak VO(2): A simple yet enduring standard. Circulation 2000;101:1080-2. 22. Kleber FX, Vietzke G, Wernecke KD, Bauer U, Opitz C, Wensel R, et al. Impairment of ventilatory efficiency in heart failure: Prognostic impact. Circulation 2000;101:2803-9. 23. Scherptong RW, Hazekamp MG, Mulder BJ, Wijers O, Swenne CA, van der Wall EE, et al. Follow-up after pulmonary valve replacement in adults with tetralogy of Fallot: Association between QRS duration and outcome. J Am Coll Cardiol 2010;56:1486-92. 24. Knauth AL, Gauvreau K, Powell AJ, Landzberg MJ, Walsh EP, Lock JE, et al. Ventricular size and function assessed by cardiac MRI predict major adverse clinical outcomes late after tetralogy of Fallot repair. Heart 2008;94:211-6. Epub 2006 Nov 29. 25. van den Berg J, Wielopolski PA, Meijboom FJ, Witsenburg M, Bogers AJ, Pattynama PM, et al. Diastolic function in repaired tetralogy of Fallot at rest and during stress: Assessment with MR imaging. Radiology 2007;243:212-9. Epub 2007 Feb 9. Babu-Narayan, S.V., Diller, G.-P., Gheta, R.R., (...), Gatzoulis, M.A., Shore, D.F. Authors of Document Kopić, D., Elezović, N., Lijić, A., (...), Vulić, M., Karanović, N.